This is the Cave Bear pocketknife from Schrade's immortalized Old Timer product line. And again, it's another example of a high-quality knife at a reasonable price. The blade is made from high carbon stainless steel, and features a single-blade lockback design into the handle. Its plain edge is actually quite sharp! 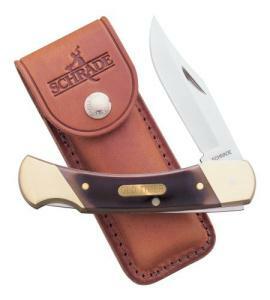 You can verify its authenticity with the small Schrade engraving on the blade near the handle. The Cave Bear's handle measures 5 inches long and comes in the classic Old Timer brass-and-wooden motif, like many other Schrade knives we've seen. Three metal studs fasten the blade to the handle, and on top, a brass plate is embossed with the words "Old Timer." Seems like a great gift to give at a 40-year old birthday party, that is, if the recipient has a good sense of humor! The pocketknife comes backed with Schrade's limited lifetime warranty, and includes a full-grain leather sheath to keep it safely stored.